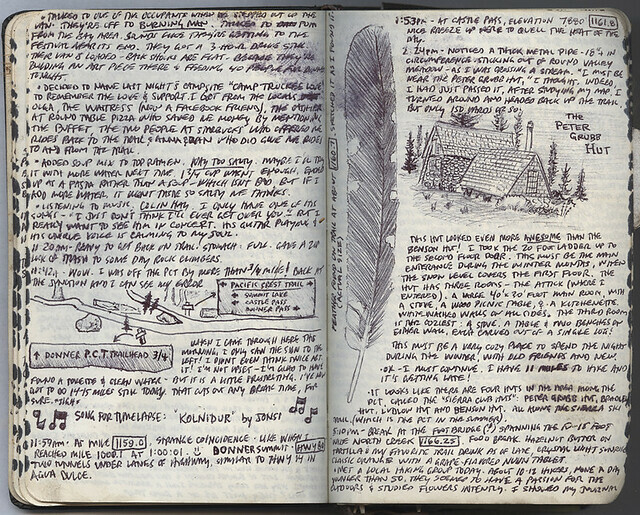 It was about ten months ago that I posted a few scanned pages from my hiking journals. 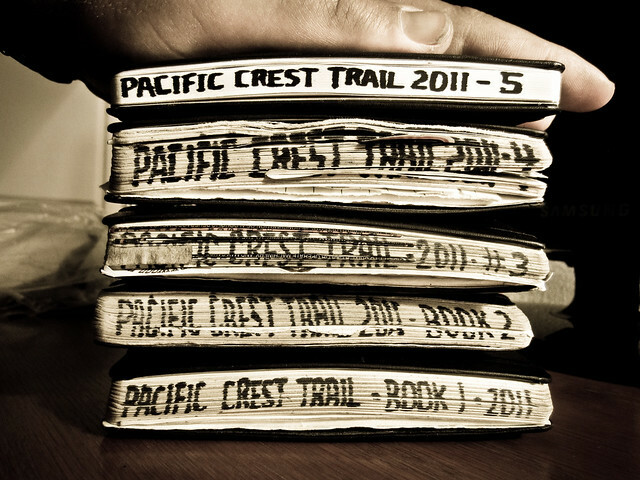 In 2010, I carried Moleskine plain pocket-sized notebooks while working hard to complete my personal goal of hiking 500 trail miles before the end of the year. I completed the goal and, in the end, filled about 300 pages in two journals, which was an extraordinary amount of writing for me. 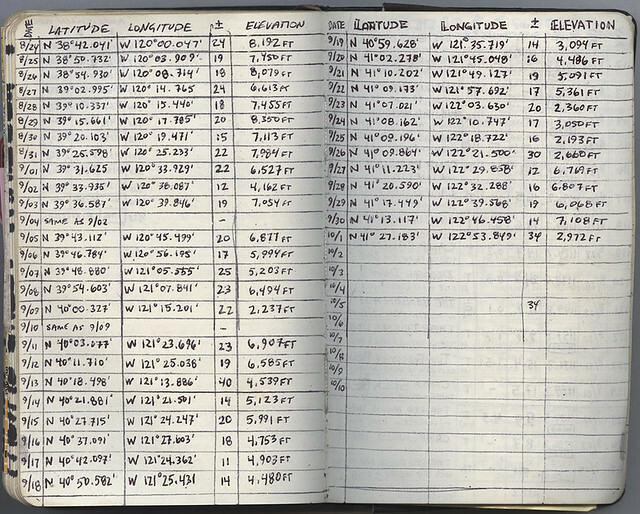 At the time I was writing that blog post, I thought about how I’d never again find myself being able to fill as many journal pages in such a short amount of time. Then April 2011 arrived. In that month, I was laid off from my job of six years and decided to hike as much as I could of the 2,650-mile Pacific Crest Trail (PCT). The journey started at the Mexican border near Campo, California, headed north through the harsh deserts of eastern California, into the wilds of the Sierra Nevada, and through the thick forests of Northern California. 159 days later, my life-changing journey came to an end in early October after hiking nearly 1,700 miles of the trail. I came home with a strong appreciation for life and nature, a thinner waistline, and over 650 pages of journals! Before sharing any of the stories, videos, or thousands of photos I took on the journey, I’d like to share that which is most precious to me: my journals. My “Tower of Moleskines:” Despite their obvious individual distortions, these are all Moleskine plain pocket-sized notebooks. All except Book 2 are hardcover. 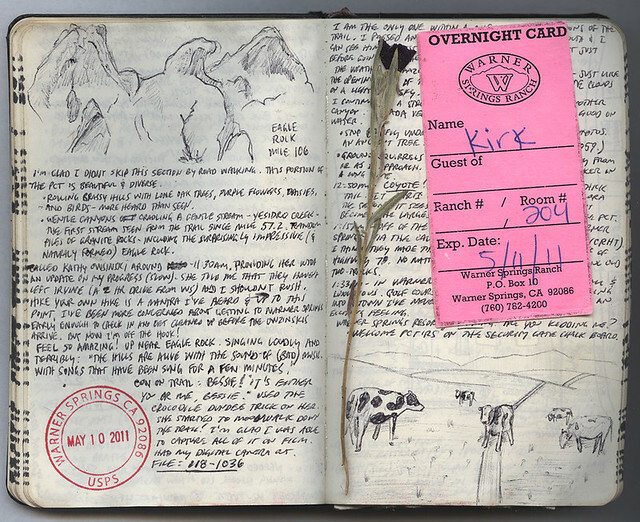 Below are my thoughts and sketches from the third day on the trail. I wrote, on average, about a dozen times a day throughout the entire journey. Sometimes I’d write for a minute or so, other times I’d sit down and write/sketch for an hour. 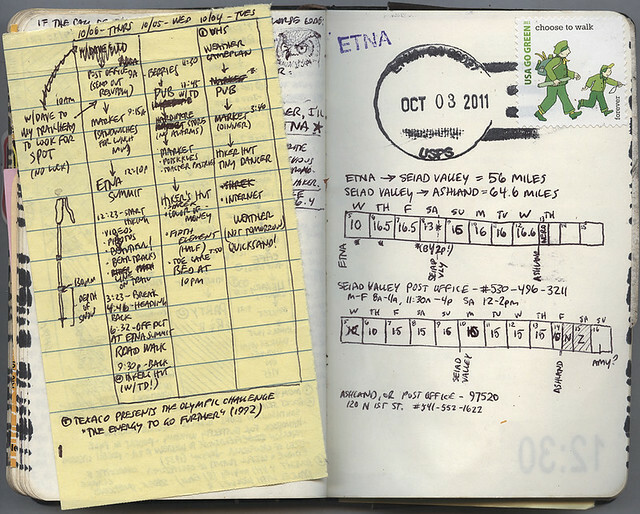 Early on, I played around with starting each journal entry with a mileage stamp, as you can see in the spread below. I’d soon move to a time stamp to make it easier. Some of my wildlife sketches were just simple doodles to hopefully recorded enough identifying features to look up later. When I could, I’d make time to sketch landscapes. 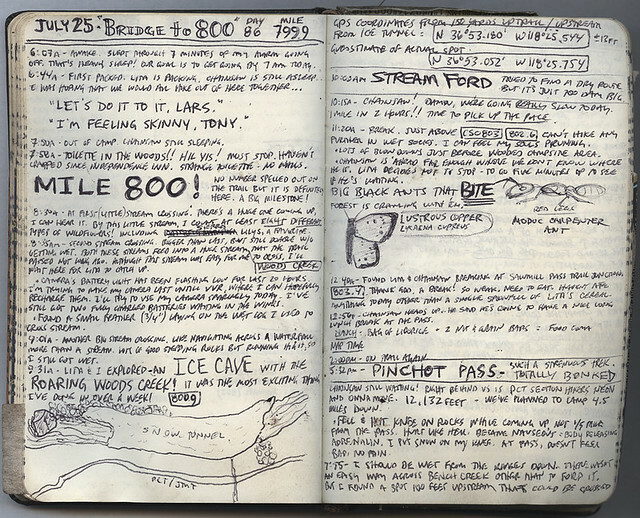 The sketch of Eagle Rock (left page) near Warner Springs, CA was done at the scene. 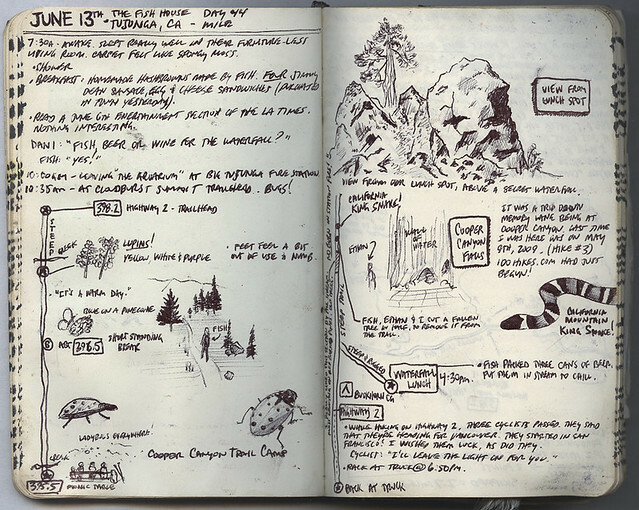 If I desired to draw a scene but didn’t make the time on the trail, I’d leave room and sketch it later based on photos I captured, as I did for the cow pasture scene (right page). 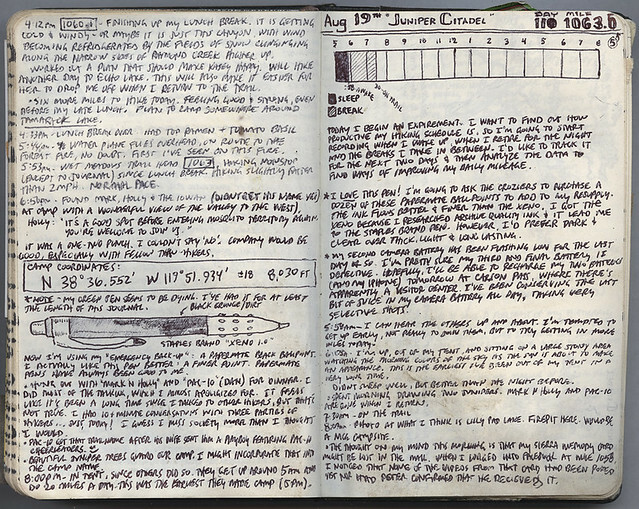 Here’s the first pages of my second journal, a soft-covered Moleskine. I learned quickly that I disliked this book as a field journal: the soft cover made it easier for moisture (sweat, rain) to get to the pages within. Note how the postal cancellation mark has smeared because of this. When possible, I’d collect interesting flowers I found along the PCT. 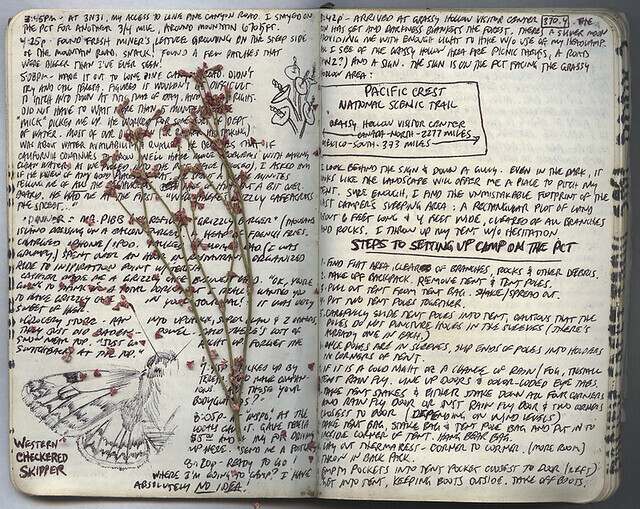 The pages of a Moleskine do a pretty good job pressing and drying out flowers. This flowering plant, however, wasn’t designed for storage. Its small flower petals began falling off almost immediately after placing it on the page. I now keep the flower and its small snowflake-like petals in a wax paper envelope for preservation. 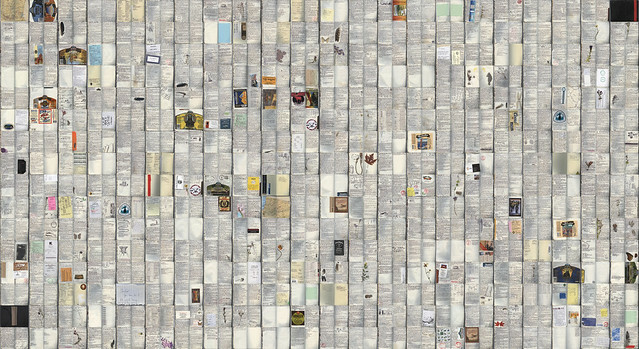 Here I experimented with a different method of recording a section of the hike by centralizing around a physical representation of the trail (left side of these pages). After about 500 miles, my hiking shorts had all but disintegrated. 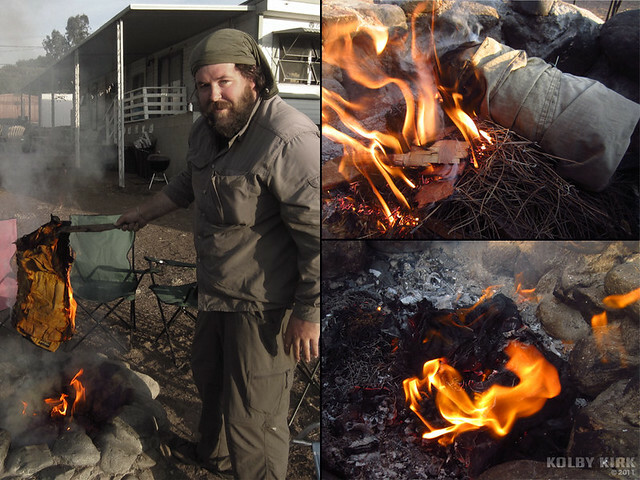 Instead of throwing the badly-shredded shorts away, I burned them in a campfire in a morning ceremony. 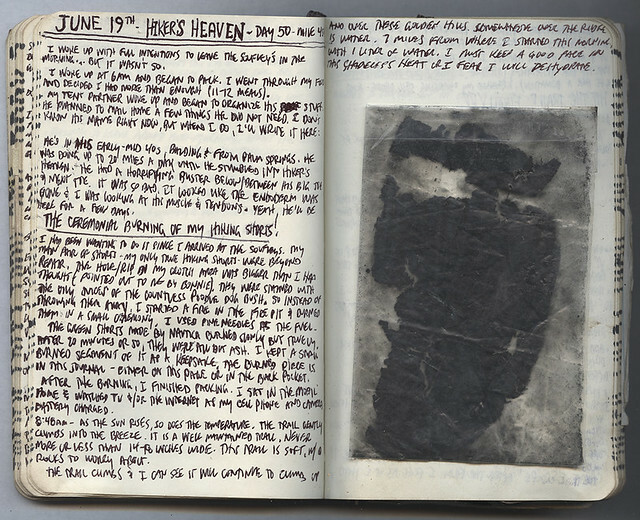 Afterwards, I took a piece of the smoldering fabric and added it to the journal as a memento. It is said that 500 miles of hiking equals about 1.1 million steps. Here’s a few pictures from the ceremony. 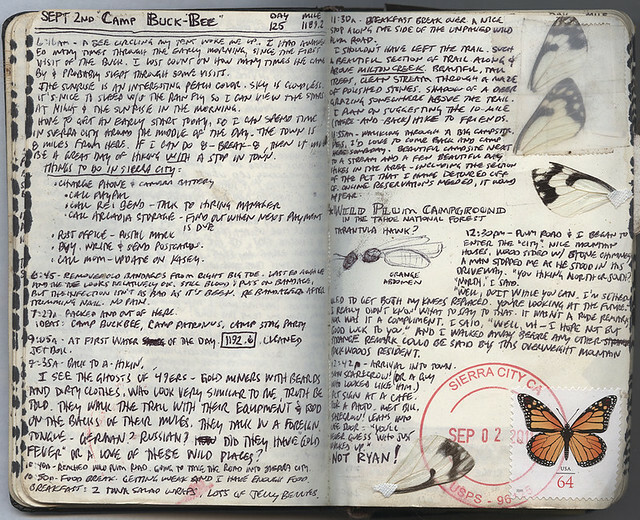 I like adding ephemera to my journals. Anything flat will do. 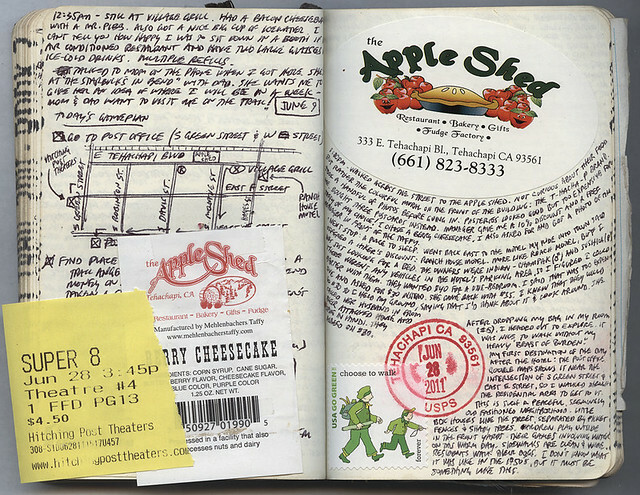 Here I have a movie ticket stub, a candy label, a sticker, a stamp and a postmark – all from the town of Tehachapi, CA. To add a different feel to the page, I tried following the contour of the oval sticker on the right page. 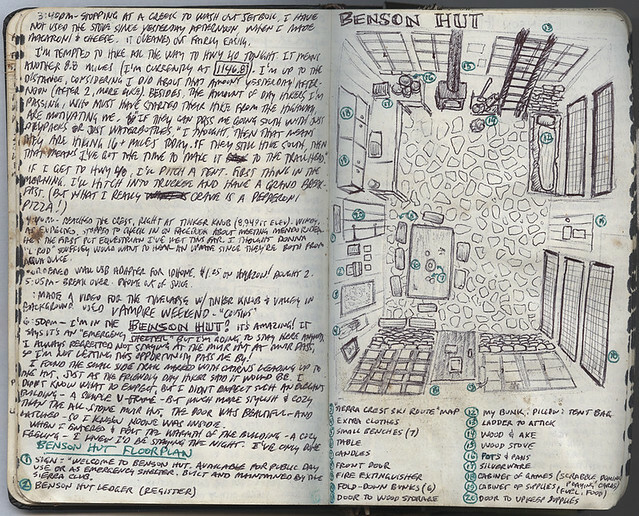 The map I sketched on the page to the left shows the area of the town where I spent most of my time. The sketch on this page was done a day or so after the writing was added. I left the gap so that I could spend time later sketching the pleasant scene of a house amongst trees. Music on my journeys is important to me. 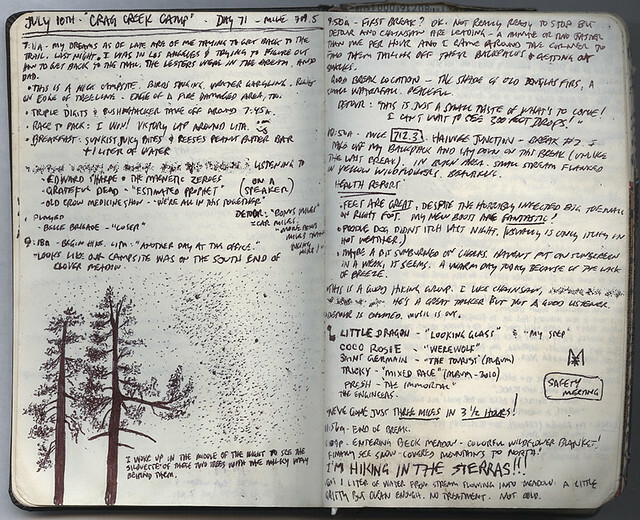 On this page, I wrote down more than a few songs that were shared on the trail. Swapping MP3 players with other hikers for a section of trail is a great way to hear some new music. On July 11th, my desire to hike all the way to Canada was waning. 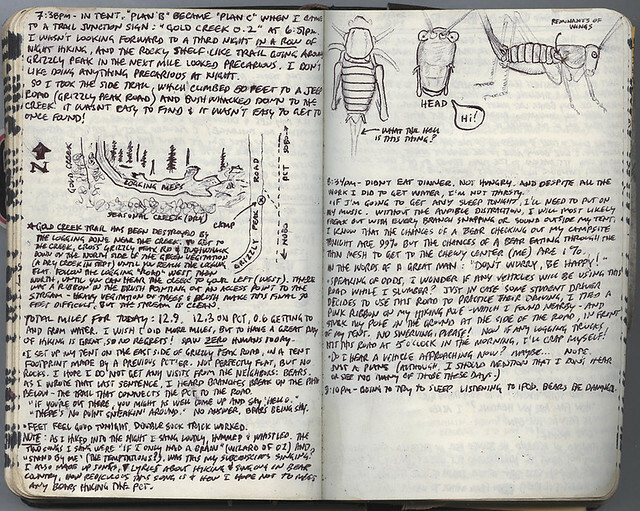 I would use my journal to define problems I would experience on the trail and come up with options for trying to solve the problem. On the left page, I listed five plans I could fall back on if my goal of hiking to Canada didn’t work for me. I ended up going with “Plan A”: “NOBO UNTIL GO NO ‘MO”, which meant I’d hike northbound (“NoBo”) until I couldn’t go any further. 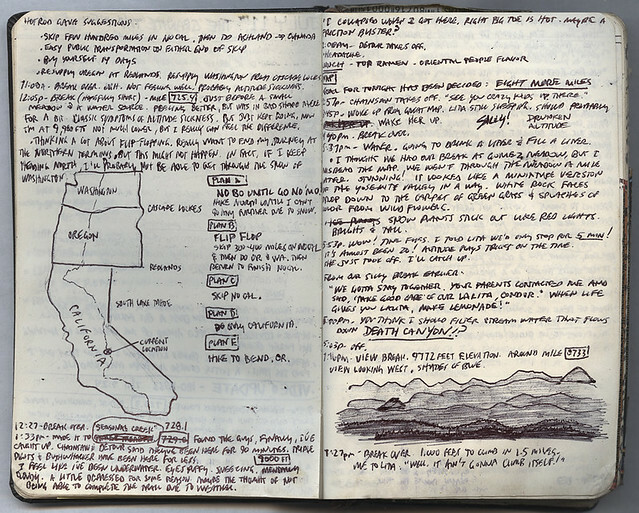 I think most thru hikers on the PCT are extremely goal-oriented people. 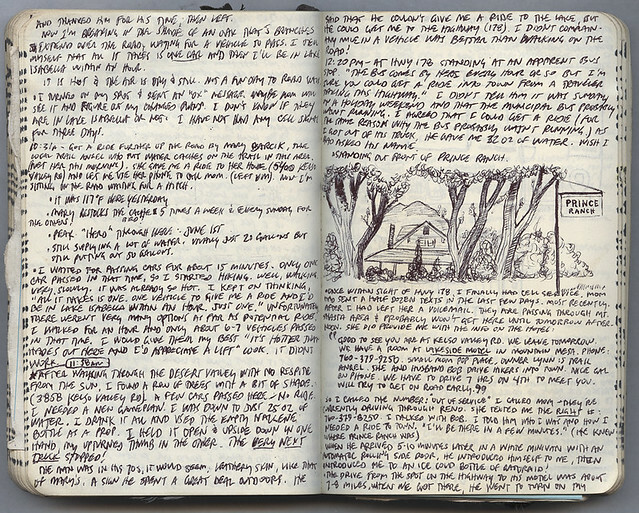 Keeping a journal helps me define my main goal as well as daily goals I would make. I found a coin in a stream while hiking through the Sierras of California. I thought for a while on how I would record the finding in my journal and came up with the idea of doing a rubbing, like one would do to preserve the patterns and lettering of a gravestone. When I eventually got a hold of a pencil, I recorded both faces of the coin on the page. 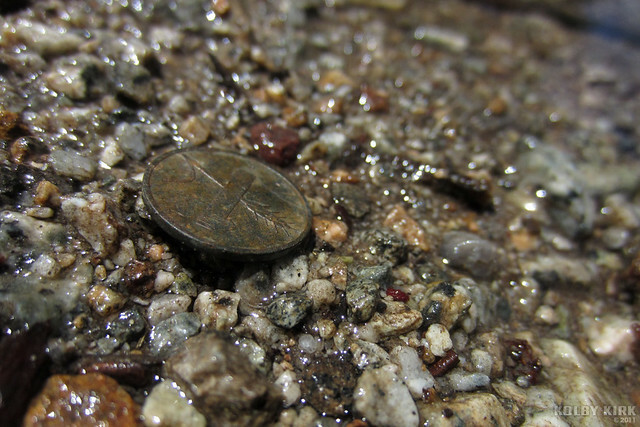 I photographed the coin where I found it, on the edge of a stream in the Sierras. I’m not an expert in coins, but I believed that the “HELVETIA” inscribed on the coin referred to Switzerland. As it happened, I ran into some Swiss hikers soon after finding the coin and they confirmed it. They also told me that this coin – a 1998 Rappen (or a Swiss penny) – is no longer used as currency, but Swiss like keeping one on them for good luck. So for good luck, I kept this penny on me for the remaining 900 miles of my journey. The more I wrote, the more a writing style was forming. I would increase the size of words to show importance. Unfortunately, despite writing so often on my journey, there were days I didn’t make time to write. Oddly enough, I had a hard time writing on “zero” days, or days of zero hiking. 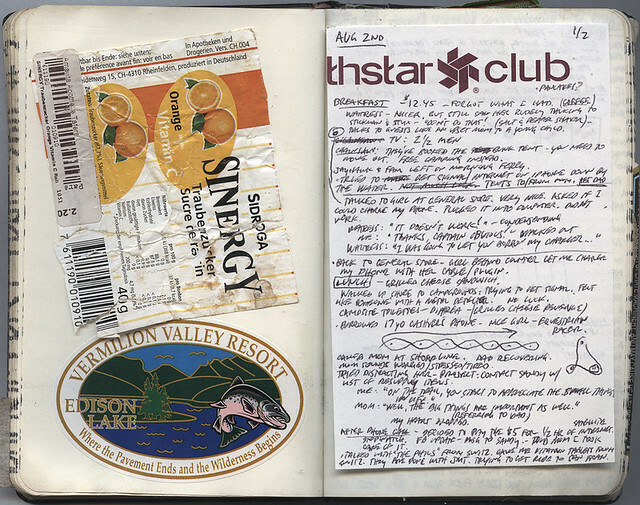 While at Vermillion Valley Resort, a hiker-friendly community just off the trail, I didn’t write at all in my journal. 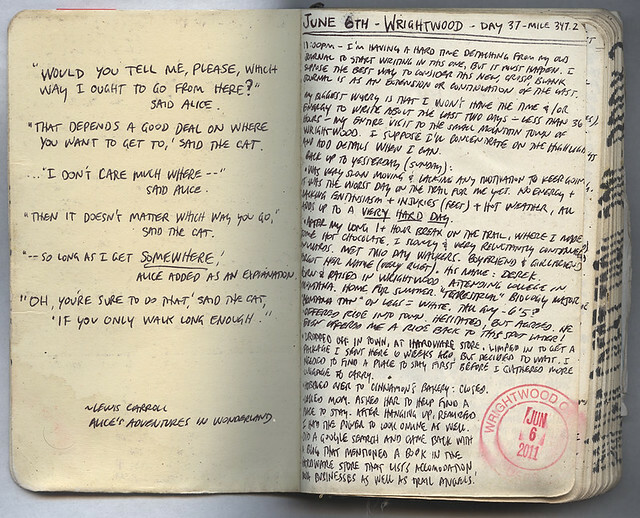 Instead, I jotted down some notes about the time spent there that will hopefully jog my memory when I get around to writing in more detail on the blank pages. I plan on doing this sooner than later, before more of those small details of the day slip away forever! 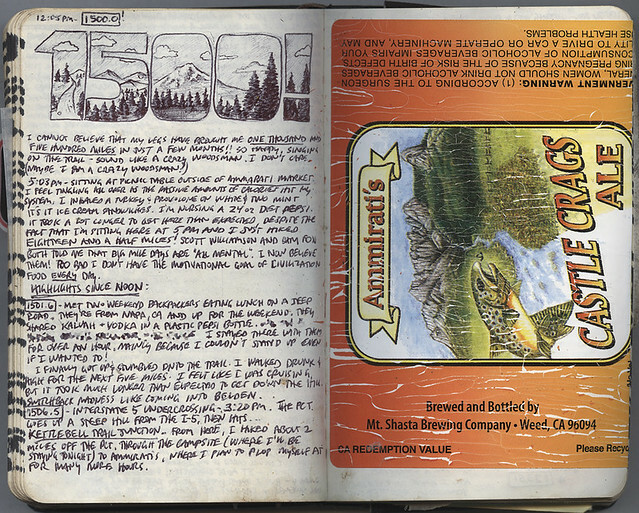 I like adding color to my pages in the form of beer labels. Plus, I like beer. Especially beer after hiking for hundreds of miles. 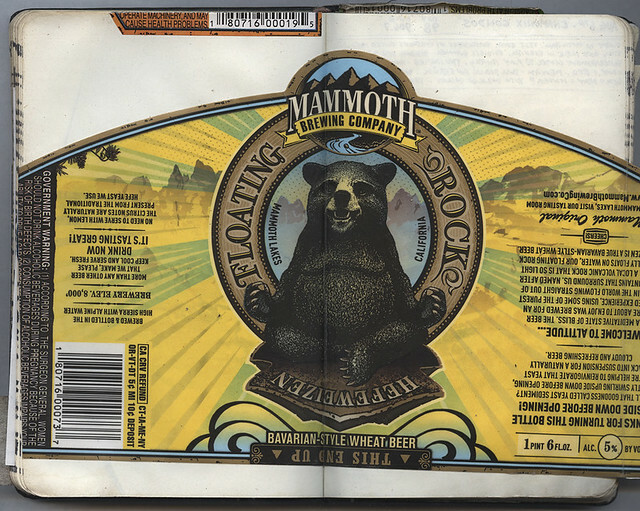 While in Mammoth Lakes, California, I took a much-anticipated trip to the Mammoth Brewing Company to try a selection of their beers. I discovered this delicious beer while on a previous backpacking trip to the Sierras. I also love the creative (and humorous) graphic design of the labels. Note how the text on the right and left of this label is meant to be read while drinking from the bottle. I made an effort to get postmarks whenever possible. In fact, I once hiked 4 miles out of my way to get one from a small-town post office off of the PCT. At the small post office in Tuolumne, located in Yosemite National Park, the postal clerk was nice enough to give me an assortment of postmarks, including one made only to be used on June 5, 2010, commemorating National Trails Day. I tend to stick with writing utensils I trust. Here you can see the exact moment I switched from a dying Staples Xeno 1.0 ballpoint pen to a Papermate ballpoint pen. I liked the slightly finer point of the Papermate that I’ve switched favorite field pens. 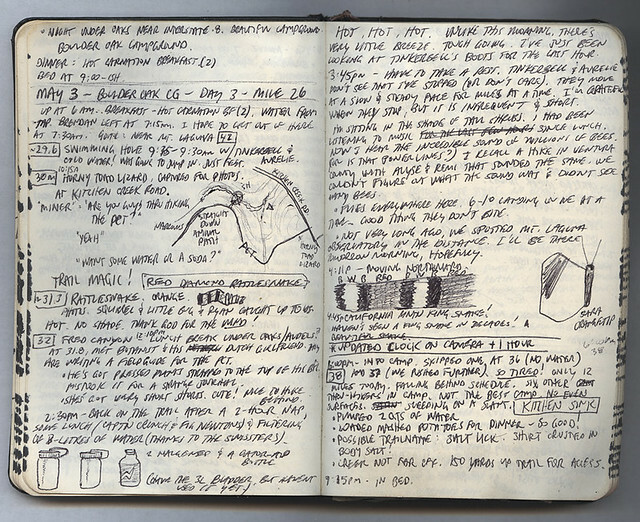 Also on this page is the beginnings of an experiment to find out how productive I am on the trail when it comes to hiking. 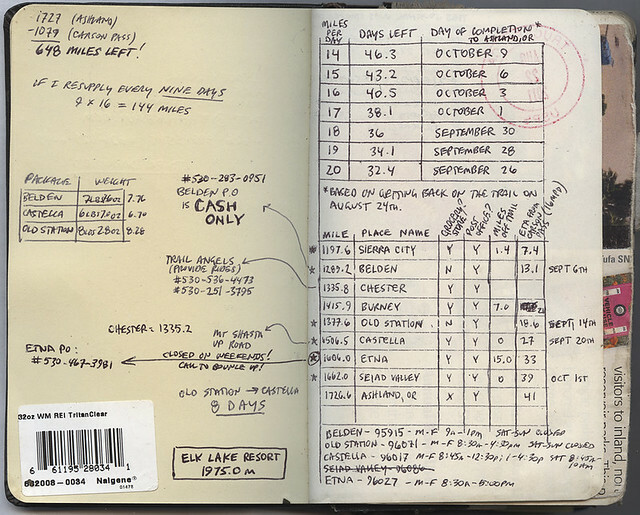 Here’s one of the first pages of my third PCT journal, providing valuable calculations/information that I would use throughout the trek: locations of post offices, their zip codes, and what mile they fall on the PCT. For instance, I noted that Etna, CA is at mile 1,606 of the PCT, located 15 miles off the trail, has a grocery store (for resupplying), and when I estimated I would arrive. I discovered the historic Benson Hut while hiking and stayed there for an evening. I spent an hour or so sketching the inside of the unique “emergency ski hut” found near Truckee, California. Sketching a place helps me remember it more vividly. 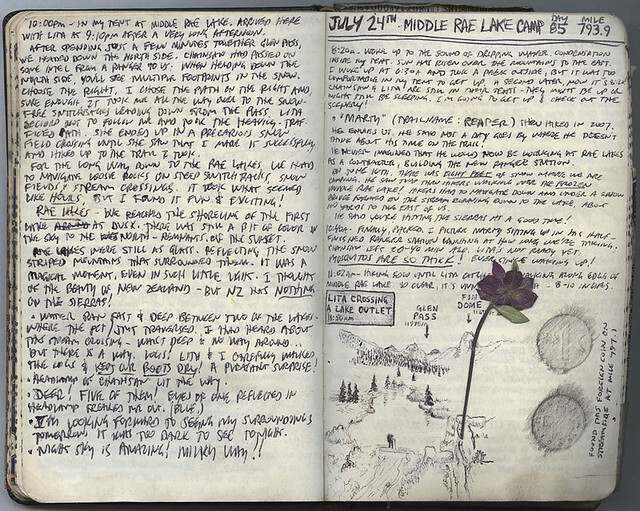 Hiking journals shouldn’t be clean unless your hike is clean. In this example, you can see dirt and smears of ink, a subtle clue that I was grimy and had just applied insect repellant to my hands. At the time, I was a little upset that the chemicals had smudged the ink, but I have learned to appreciate that my journal records more than just the words I print on it, for better or worse. Now here’s something I found interesting: each of the four black and white butterfly wings were found miles from each other along the trail. I rarely saw this species of butterfly alive, but it seems to be a popular snack of the local bird population. When I arrived into Sierra City and went to the post office, it seemed appropriate to adhere the 64-cent Monarch stamp on the page. 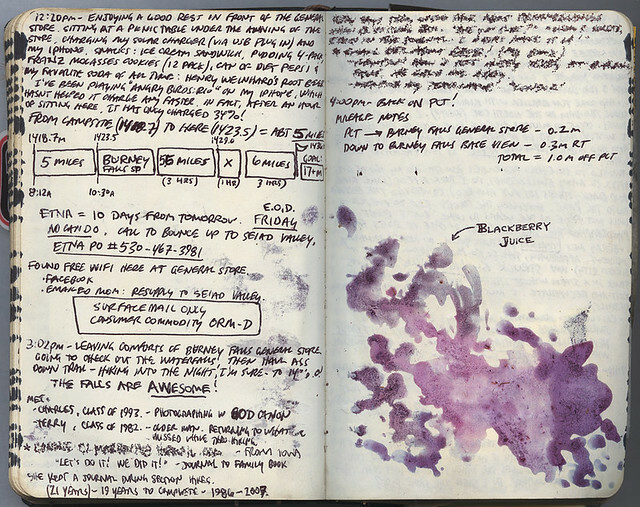 To record the excitement and messiness of finding ripe blackberries on the PCT, I smeared the berries onto the page. 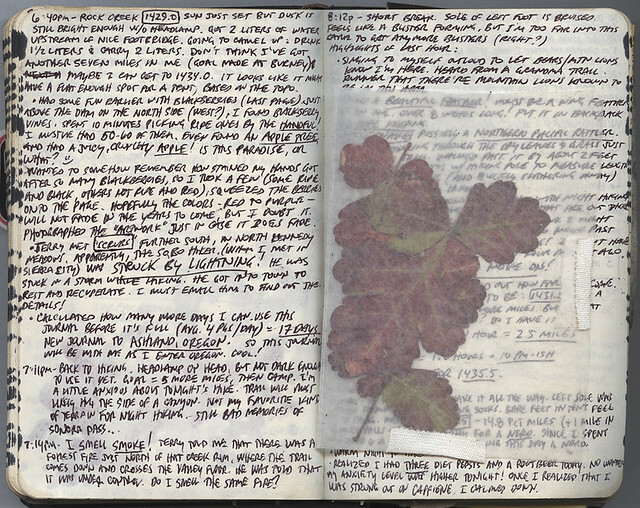 Until then, I never considered using natural pigments as a way of adding color to my journals. Am I the only one who finds beauty in the colors of poison oak? They say that “leaves of three, leave them be!” but I broke the rule and plucked a few for my journal, careful not to touch them. On this journey, I started carrying scraps of wax paper in the back pocket of my Moleskine to be used in preserving items like this. On the left, I recorded a water source near the trail that isn’t well documented in the books and maps. I also found an interesting Orthopteran that I took time to sketch on the trail. I enjoy coming home with these sketches and try identifying them in my collection of nature guidebooks. If I’m confident in its identification, I’ll go back and write the common and scientific name in the journal. Reaching mile 1,500 on the PCT was a feel-good moment for me. I never thought I’d be able to hike so far. It just goes to show you that anything is possible if you put your mind to it. One of my favorite stamps to look for in the post offices along the trail is the Go Green stamp called “CHOOSE TO WALK.” It was the perfect representation for my journey. 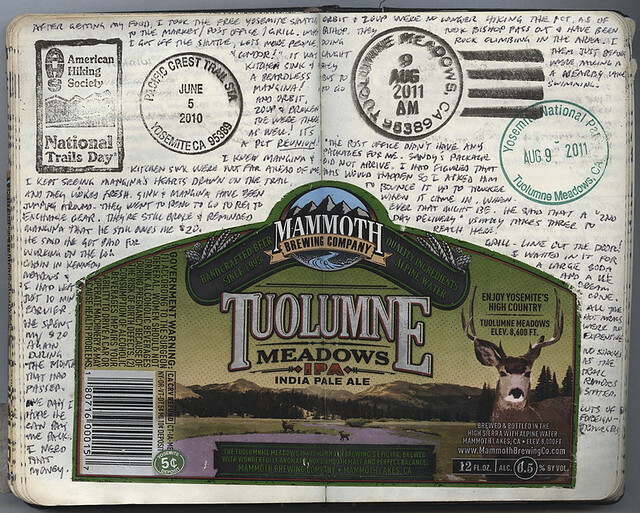 (Unfortunately, in this instance, I forgot to put the stamp in the journal BEFORE getting it post marked. d’oh!). 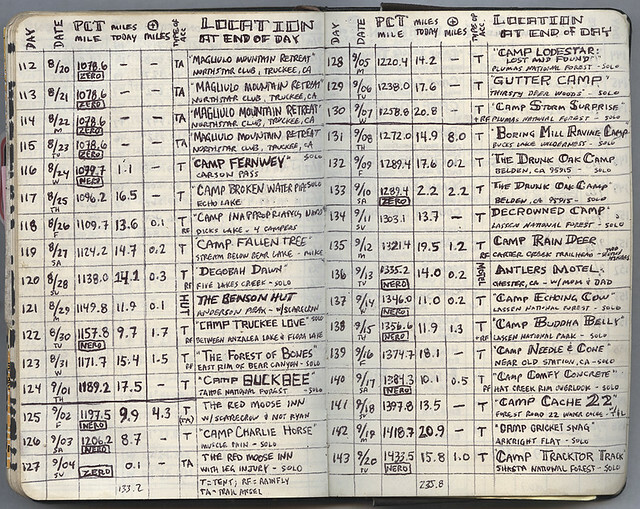 The notes below the stamp are mileage estimates designed to calculate food resupplies. The thrown in notes on the left are for when I find time to write about the week I spent in Etna waiting for a snowstorm to roll through. Unbeknownst to me at the time, these would be my final days on my journey. The snow was too deep and so I called the hike finished, leaving the trail and going home on October 6th. I love hiking data. Here I diligently recorded my latitude and longitude every evening from my campsite. I picture myself someday revisit these sites with my family, maybe even with my unborn children. More PCT data. Everyday at the end of the day, I would record what PCT mile I was at, how many miles I did that day, what kind of accommodation I stayed in (ex. “T”=tent), and the location. I had fun naming my campsites if they had not already been named. For instance, “Camp Buddha Belly” was the name I gave the campsite I stayed at immediately after leaving Drakesbad on a full stomach. 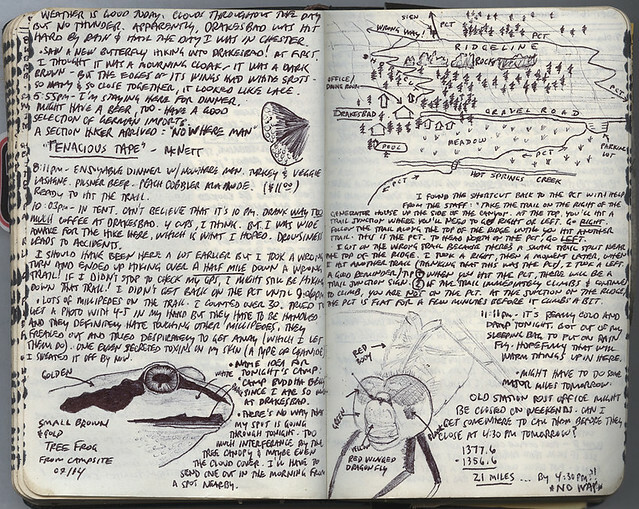 While on this amazing journey, I learned a lot about myself and the art of keeping a journal. Since you made it this far in the post, maybe you’d like to learn more? I am currently writing a guidebook that I hope will help hikers and travelers start and retain their own journals while on the trail. If you follow me on Twitter (@thehikeguy), I’ll keep you posted on the book’s publication.